The language we use everyday has the ability to change how people think about the world. Our ideas about reframing the language of traffic violence are starting to take root nationally! Still, many news media outlets and even cities still call preventable crashes “accidents.” By doing so, it frames traffic deaths as unavoidable byproducts of our transportation system. In reality, these deaths are unnecessary, and often the result of 1950s era car-oriented engineering and/or unacceptable driver behavior. When media outlets label traffic collisions “accidents” before the causes have been studied, it is biased and journalistically reckless – and we encourage you to join us in calling them out. 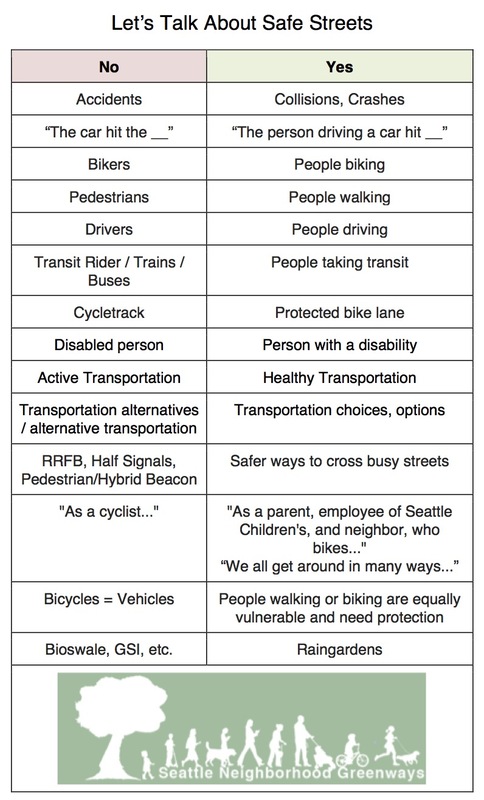 By working to change our society’s language to neutral language that describes “collisions” where “a person driving a car hit three people walking” we can undo the false idea that traffic deaths are a normal part of our transportation system. Our coalition of thoughtful local leaders and advocates have learned through thousands of conversations what language cuts through engineering gobbledegook and connects to our shared humanity. This handy cheat sheet distills the our knowledge of what language resonates and what doesn’t. Public meetings are often when things can get heated. At these meetings, our leaders have learned that it is critical to talk about hyperlocal issues using your neighborhood’s language, and to focus on people and their needs (quiet street to raise a family, walking to the bus stop, being safe dropping off their kids at school, etc), rather than on modes of transportation.